Creating a sample from my sketchbooks. As you might have seen in my sketchbook pages update I gave myself a bit of a written telling off for not using colour more. I realised that by choosing a sketch with colour and texture I had to narrow myself to around 6 images, a few of which I’d already stitched! I decided on a slate image and wanted to go with a more scrappy look, as my previous samples were more rigid and ‘designed’. I prefer the more ordered look but wanted to try to stretch myself. 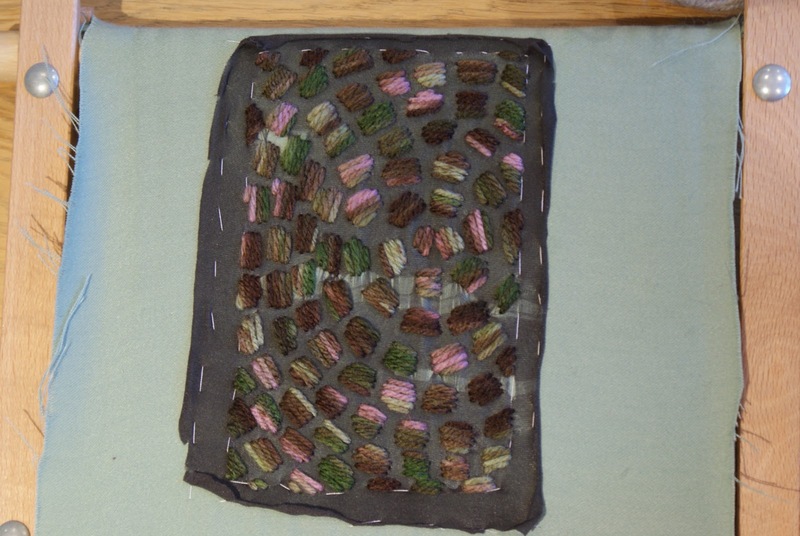 The course said to select the yarns and wrap them to create a sort of sample board. I guess looking back I could have realised at that point that the colours are not exactly ‘blending’ and don’t look very slate-like at all! The sample itself I did enjoy doing, though I quickly saw that the effect I had in my head was not going to translate onto the work! Perhaps I need to loosen up in some ways, but still put thought into the process, maybe if I’d had more thought in my yarns the finished sample wouldn’t look such a mess. But then again I think it looks a mess just because it is not really my style! I still show the shapes of tiling, and there is an element of the reflections you see on a wet tile in the sunshine. Yes, I think I grasped this in Project 1 – marks made on paper and on fabric are essentially the same thing, though obviously they each have their own properties (stitching having 3 dimensionality for example). I mainly stuck to running and satin stitches because of the nature of my lines. I did go further in the last sample but the stitches didn’t necessarily ‘represent’ the lines or texture I had made on paper. I worked from drawings that were originally inspired by my photographs of man-made textures and patterns. I really enjoyed this and believe that yes, I chose the right source material. My final sample… no! I think that this is a good way to explain how I feel about that – that it is merely an interpretation of my drawing and doesn’t stand up on its own two feet! HOWEVER, my previous sample – “If you have time, work a small sample trying to relate some of these effects to your drawings”, show below, I think that does work well irrespective of the drawing, and I’d love to explore this style further. I can see it being an amazing cushion or even wall art. I think that that maybe I haven’t explored enough with the different stitches. I love pretty much everything that Sharon of PinTangle does and particularly her textures created with stitch. However, I think I preferred best working with yarns to create textures – I love the simplicity of basic stitches and bringing in different yarns within those stitches to create texture. Even just answering these questions I think my ‘style’ will probably go down the more subtle, simple route. Creating texture with choice of materials and pattern. I think I experimented enough without taking eons to complete this section of the course (I could sit down and continue for years making endless variations to see ‘what if I’). I don’t think I felt inhibited in any way other than time. Definitely working from a drawing. If my preference for my samples were on a basis of 1-10 then my blue squares sampler and cobbled roundabout sampler shown above would get an 8 whereas my ‘just go for it’ tiles would get a 2. I know I was working from a drawing on the final sample but I was deliberately just kind of playing and letting go. However I do think that if I play with fabric and yarns (without stitching together) then I can try to get an idea of ‘what if’, then sketch, then stitch a sample if theres anything I think ‘could work’. Are there any other techniques you’d like to try? Are there any samples you would like to do in a different way? Yes and Yes. Hundreds. Too many to count. I feel like I want to try the cobblestone sample in infinite other ways with different patterns/yarns/stitch placements for example. And I feel the same about other samples and other drawings. I’m itching to try other techniques but know that many will be covered, if not in this course then in others. Is there anything you would like to change in your work? There are some things I would change from the work I’ve already produced should I ever create the same sample (I guess thats the whole point of creating a sample…). I’d never even consider going back and changing something now. In the *way* I work, I’m going to be focusing more on pouring my thoughts into the sketchbooks/workbooks rather than saving it for a blog post. I’m going to think more about the materials and make more sketches of an image I want to sample before stitching.